Midnight Blues- 16" x 25". Hand-dyed and discharged cotton, lace, lamé, recycled fibers, natural wool fibers, recycled buttons, copper wire, glass beads. Machine pieced, hand and machine quilted, painted, hand beaded. A friend gave me the discharged cotton (black fabric treated with bleach to take some of the color out), and I loved the copper tones against the black, so I started with that as a base. I dyed the blue fabric and pulled off some of the fibers to use separately. 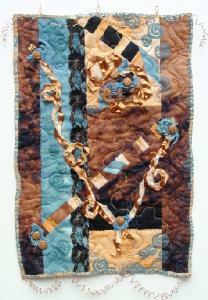 As the quilt went together, it felt as if it had a sort of jazz rhythm - thus the name.